"They are what they sound like. Delicious. Serve as appetizer. Doesn't need too much sauce. Just adds the perfect amount of flavor!" Mix butter, brown sugar, vinegar, soy sauce, and garlic in a saucepan; cook and stir mixture over medium heat until sugar is dissolved, about 10 minutes. 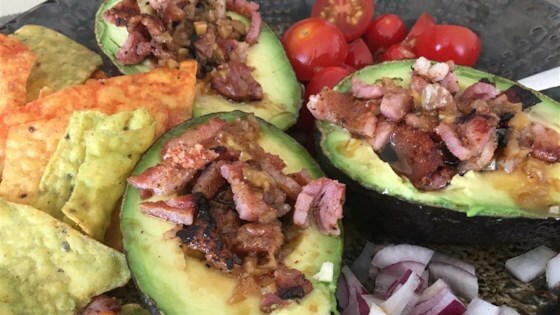 Sprinkle avocado halves with salt; fill each half with crumbled bacon. Drizzle sauce over filled avocados. Delicious! I brought these to a party and everyone loved them. The sauce is amazing just as it is. I made this with no changes. It was delicious. The sauce was quite sweet so I may cut the brown suger next time. Definitely making this again. Delicious! Mmm the sauce I could just scoop up and sip by itself! Excellent and will make again! I had to substitute 3 tbs apple cider vinegar for the 1/4 cup red wine vinegar and it was fabulous. definitely a keeper and I will likely stick with apple cider vinegar.